New year, new me as the cliche goes — but for some Flames, ringing in the New Year should come with new resolutions. With the up-and-down season the Flames have endured to this point, they find themselves on the cusp of a playoff spot with a large portion of the season still remaining. To make it to the promise land of postseason hockey, some Flames will need to improve their play to remain in the hunt of Lord Stanley’s coveted mug. At this point in the year, Bouma is being bounced from the lineup by 25-year-old, unbroken, Garnet Hathaway. The two play a similar style, throwing offensive ability to the backseat whilst driving full speed commanding the attention of viewers with fast, heavy play. They skate hard, north-south styles, while hurling their bodies with no refrain. 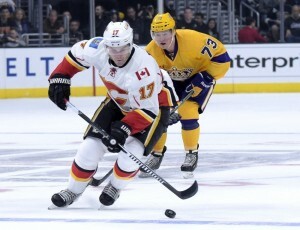 These role-playing members of your team are important to a certain point, but with Bouma’s hefty price tag of $2.2 million, there needs to be notable improvement in the offensive aspect if he expects to stay relevant in the Flames lineup. Hathaway, who pockets a paltry $690,000 shows the glaring mistake of Bouma’s current contract. Perhaps injuries have caught up to Bouma as he is coming off of a separated shoulder which caused him to miss 16 games, but this is just the tip of the iceberg in evaluating what has ailed Bouma. Looking at a rap sheet of Bouma’s last two years: Oblique strain, leg laceration and a broken fibula. To say he is damaged goods is a tad disingenuous, but he is in no way the same, healthy, virulent forward the Flames once possessed. Bouma needs to become effective in the Flames’ lineup once again, and this starts with creating offense as in his 18 games played this year, Bouma has created a meager nine shots on 11:21 average total ice time (ATOI). To say there is room for improvement is an understatement. In 2017, Bouma needs to be better all-around. Question is, does he have the tools to complete the job? Seen as the surefire choice to be taken in this summer’s impending expansion draft, Jokipakka has fallen into relative obscurity, losing minutes to the likes of Brett Kulak and Tyler Wotherspoon. Acquired at the trade deadline last year, Jokipakka stunned Flames fans with his quiet, effective style in being a calm and confident puck-moving defenseman. Where has this demeanor gone? Possibly being with Deryk Engelland as his go-to partner has something to do with this as Engelland is less than effective at moving the puck. However, Jokipakka has to be better for this Flames lineup in order to secure his spot as a regular fifth-sixth d-man. At this point, it seems like he borders on seventh in terms of effectiveness in driving or shutting down possession. As a restricted free agent at the end of the season, Jokipakka also holds arbitration rights in which he could leverage a deal to his benefit. But if his play is to continue at this level, $900,000 could be all that he fetches as this more or less seems to be his peak. The jury is still out on Jokipakka. As a 25-year-old, he still has time on his side, but currently he has become expendable, if he wasn’t already. In 2017, Jokipakka has to steal the fifth, sixth d-man spot and hold it without question of his effectiveness. Brouwer has found a spot on an ineffective offensive line, alongside Versteeg and Monahan. But largely, he is ineffective in creating offense and driving possession. Brouwer, who makes a large sum of $4.5 million, needs to be held responsible for his inability to effectively drive possession at a mere 43.2 Corsi For Percentage (CF%), paired with 53.6 offensive zone starts (oZS%). This doesn’t imbue the most confidence on paper. But it’s all but apparent when you watch him play as well, as there is regular hesitation and loss of possession on failure to gain clean zone entries. Overall, Brouwer has been below-average for the Flames so far, and if this is a sign of what’s to come in his future, it’s going to be a taxing four years. Leadership qualities aside, Brouwer needs to produce. In 2017, Brouwer has to be effective in turning defensive possession in to offensive opportunity, while still remaining defensively responsible. His price tag leads me to expect this from him. Although the Flames have pulled themselves out of the grave they dug themselves to begin the year, there remains a generous portion of work on the table. This starts with the creation of opportunity for this short-list of players. With hot goaltending and blazing hot special teams, there are minor things being ignored or glossed over. Ultimately, the Flames are not infallible. There are simply issues which require attention. Perhaps Bouma is too broken to return to form, perhaps Jokipakka just isn’t comfortable with the system and perhaps Brouwer was an over payment after all. What matters now is that these players find a way to play to their potential, in whichever way possible. And it starts with taking it one game at a time, earning the time. Reclamation project or not, the Flames need more from their supporting cast.